The published accounts will tell you that the much-loved Sylvia was built by Abraham Goldstein, and named for his daughter, Sylvia. 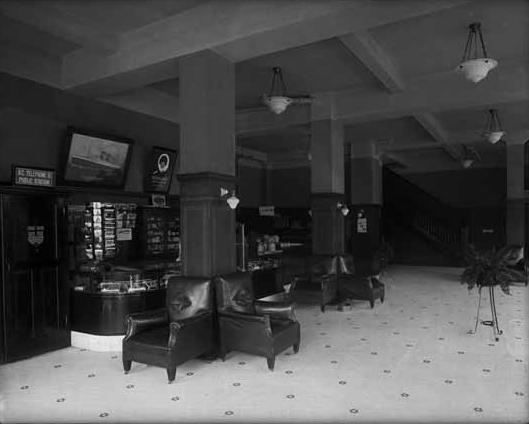 The hotel started life as the Sylvia Apartments, and was named for Mr. Goldstein’s eldest daughter. However, according to his marriage certificate Mr Goldstein’s name was Adolf, and he was born in Russia, and the 1901 census has him as Adolph, born in Germany, while in the 1911 census he was shown as A D Goldstein and being born in Poland. Eastern European borders were often changing and confused, but it’s almost certain that Mr. Goldstein came from the Pale of Settlement, the area of Russia created by Catherine the Great in 1791 that Jewish settlers were allowed to move to. His wife, Sarah Jonas, came from Timaru, New Zealand, and they married in Vancouver in October 1899, and first show up in the Street Directory in 1900. Sarah’s father was known as Moss, but he had been born Moses Jonas, in Brighton, England, became a seaman and having moved to Timaru was an auctioneer, built a theatre, the town’s synagogue, and was elected mayor. In 1903 A D Goldstein was a manufacturer’s agent living on Pender Street (the same occupation as in the 1901 census), but by 1906 he was shown as a financial broker. The family are identified on the 1911 census with 11-year-old Sylvia, Cyril, aged eight and Aileen who was two. Sarah’s sister, Clara Gossage was living with them, and so was J M Goldstein, Adolph’s brother, and a four year old nephew. There was also a domestic servant, K F Pearson. In 1913 when his $250,000 investment, designed by Seattle architect W P White and built by Booker, Campbell & Whipple was completed, Mr. Goldstein was still listed as Adolph, still a financial broker, living on Pendrell St. (He had G H Moon design alterations to his home and added a garage, also in 1913). Isaac Goldstein was working with him, living on Nelson Street. In 1914 Mr. Goldstein’s name appears for the first time as Abe, no doubt in part because having a German name wasn’t necessarily a comfortable experience at that time. Isaac Goldstein appears to have left the city around 1916. In 1923 Abe D Goldstein is shown as the proprietor of the Sylvia Apartments, and Cyril is shown living at home on Pendrell, working as a law student at Tupper and Bull. Sylvia was at home as well. The family moved to the US that year. In 1930 Abraham and Sarah were living in Los Angeles with their son, Cyril. Sylvia went with them, having obtained a degree from UBC. However, she returned to Vancouver, and while taking a boat trip with a group of Jewish singles caught the attention of her future husband, Harry Ablowitz, by diving off the boat into False Creek. (She was a strong swimmer, having been taught by Joe Fortes). The couple were married in 1928 and settled in North Vancouver, later founding a realty company. Both Sylvia and Harry Ablowitz were active in the Vancouver business community and in numerous Jewish organizations. Sylvia sat on the board of many Jewish community groups and helped to establish the Jewish Community Centre, the Louis Brier Home, a hospital at Oak and 41st Avenue and a golf course. She was a member of the National Council of Jewish Women and, until her mid-90s, was still volunteering her services with the Jewish Family Service Agency, doing telephone checks for isolated seniors. She died at UBC hospital aged 102. Our image shows the hotel in 1932 when it was still surrounded by houses and dominated the newly-planted street. 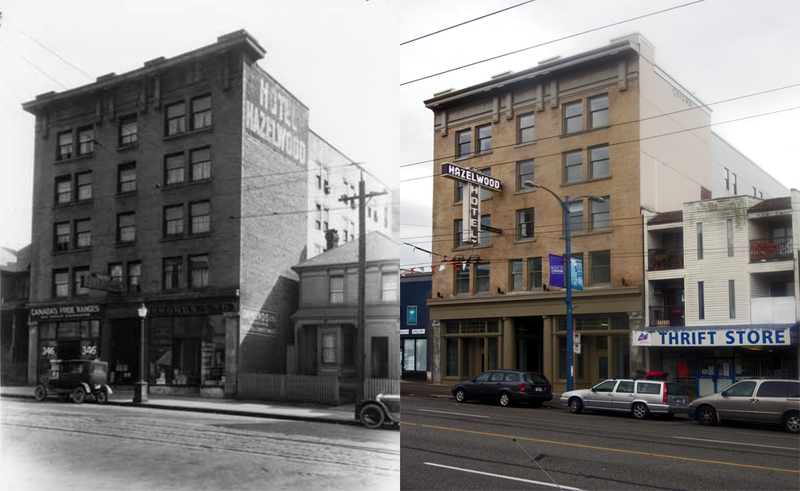 In 1936, the Sylvia Hotel, then in receivership, was transformed into an apartment hotel and by the beginning of the Second World War, many of the suites had been converted into single rooms. 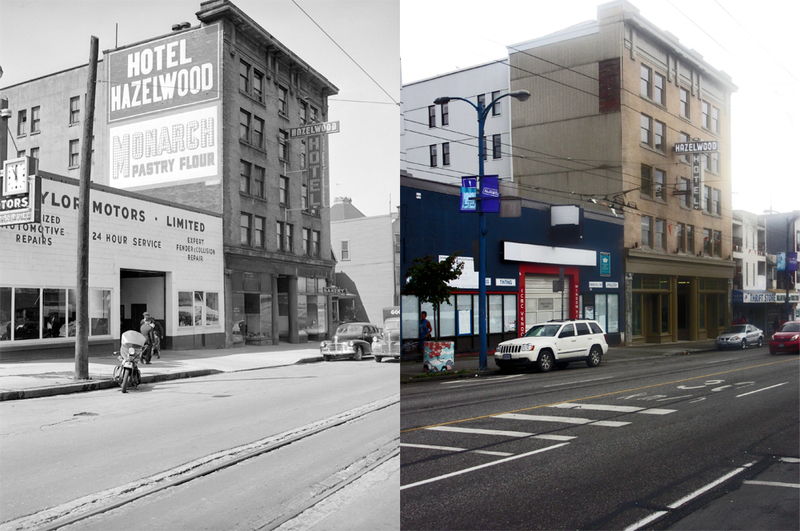 While many hotels in Vancouver ended up as apartments or SRO hotels, the Sylvia went the opposite way. By the 1960s it had become a full-service hotel. Prior to the building boom in the West End during the 1960s, The Sylvia’s dining room was on the eighth floor with a slogan of “first-class dining in the sky,” Today it has been relocated to ground floor level, and offers one of the best views out over English Bay, past the trees that in summer now obscure the view from the upper floors. We looked at the history of the St Regis and its developer, Leon Melekov, in an earlier post. He had been in Canada less than ten years, since arriving from Russia in 1902. He was only aged 38 when the hotel opened, having cost $100,000 to build. Like other eastern European emigres, Leon Melekov was Jewish. For a couple of years there was some ambiguity about the hotel’s name – it appeared as both Hotel St Regis, and the St Regis Hotel, but by 1915, when these Vancouver Public Library images are dated, it was just the latter; run by H Tolford Fitzsimmons. There was a separate office address listed for the ownership company, based in the Bank of Ottawa building in the offices of Deacon Deacon & Wilson, barristers. Mr. Fitzsimmons had taken over the hotel in 1914, and he had been living in Brockville Ontario in the earlier years of the century, where he had been born in 1850. He married Fanny (or perhaps Fannie) Conway, and they had a large family. When he died at the age of 92, Mr. Fitzsimmons was living in Victoria. The hotel’s website has a quite different version of events: “During Vancouver’s “Golden Years of Growth” from 1907 to 1913, P. Roberts of Roberts, Maltby and Company, a local Real Estate and Loan company, decided to build the St. Regis Vancouver Hotel for his wife Mary. 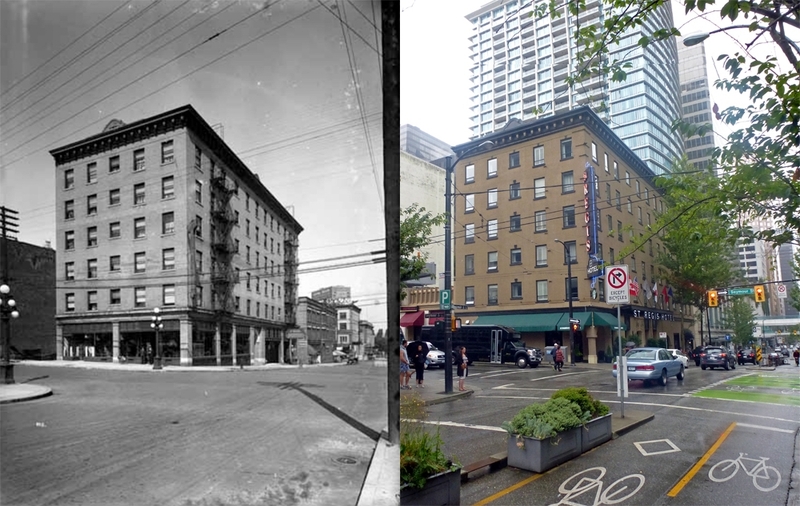 Taking advantage of the hotel’s close proximity to Vancouver’s financial district on West Hastings, Mr. Roberts decided to build one of what would become a top historic hotel in Vancouver for the business traveler. He employed W.T. Whiteway, one of the leading architects in the British Empire, to design his hotel. Mr. Whiteway had designed the World Building, now the Sun Tower, which had just opened as the tallest building in the Empire. He also went on to design the Marine Building, which was the tallest building in the Empire from 1930 to 1939. Having the top architect also meant Mr. Roberts had to hire Canada’s top builder – E.J. Ryan, whose resume included the Marine Building, Hotel Vancouver, Harrison Hot Springs and numerous hotels across Canada. We agree that W T Whiteway was the architect; and that he designed the Sun Tower, but he certainly couldn’t take credit for the Marine Building, and to suggest he was a leading architect in the British Empire would be pushing things a bit – he designed buildings in Port Townsend in the US, and then Newfoundland and Nova Scotia before Vancouver. We identified Mr Melekov as the developer as his name was on the Building Permit, and the Province newspaper in 1912 called it a “hotel for Leon Melekov”. The Daily Building Record noted that his hotel was being built by E J Ryan, who issued requests for subcontracts for the building in 1912. 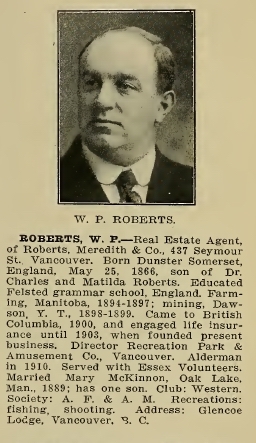 There wasn’t a P Roberts in Vancouver, but there was a William P Roberts at Roberts, Maltby & Co, previously Roberts, Meredith & Co. His 1913 biography is shown here – there’s no suggestion that he had just developed a hotel. The other half of the block is Century House, built in 1911 for the Canada Permanent Mortgage Corporation. The building was designed by J S D Taylor, an architect trained in Scotland. Canada Permanent operated at Century House until 1951. Since then, it has been home to an insurance company, a trade school, an antique store, a book store and a restaurant. Today it appears on the internet as a recording studio. The exterior is made of cut granite stone, except for two beavers and a lighthouse cast in concrete, which crown the buildings. It’s the emblem of the building’s developer. There’s not much changed between our 1978 image and today. The Orwell was developed in 1911, and if anything it’s in better condition now than then. BC Housing acquired the building in 2007, and have carried out a series of improvements and restored the façade, which was designed by W P White. Today it’s run by Vancouver Native Housing Society. When it was developed H S Rowling was the developer, and Booker, Campbell & Whipple were the builders of the $70,000 reinforced concrete building. As far as we could tell from Building Permits it was Mr. Rowling’s only development project, although that turns out to be inaccurate. Henry Soar Rowling was President of the Vancouver Real Estate Co, and unusually, he was a local. He was born in New Westminster in 1864, son of a Royal Engineer who arrived in British Columbia in 1858 on the North American Boundary Commission. Henry was a contractor in 1881, later operating tugboats on the Fraser River and then the Burnett River that runs out of Burnaby Lake. In conversation with Major Matthews he recalled hauling logs to the mills, including along a skid road where Gore Avenue is today, near Greer’s Beach (in Kitsilano) and from Brockton Point (in Stanley park). In 1903 he moved into real estate. A 1914 biography said he owned two business blocks, ‘and much business and residential property’ as well as the Orwell (a rooming house when it was built) he constructed a building on the corner of Vernon and Albert Streets. It’s been a while since any single family houses on Richards Street have been able to boast a waterfront view; (that’s False Creek in the background). The photograph is said to show Rev. J.H. Pedley on the balcony, and Mrs. Charlotte Ellen Reed Pedley on the porch. The Reverend was newly arrived in town, and the pastor of the newly built Congregational Church which was also on Richards Street just across the street. The church was designed by William Blackmore, so if an architect was involved in designing the house, it would probably be him. The Reverend Pedley didn’t stay in Vancouver very long, but fortunately for us he was still here when the 1891 Census was collected, so we know he was English, but his wife was from Ontario. He was aged 34, his wife was four years younger, and the Census shows no other household members. There’s very little more that we’ve discovered about the pastor, who was the first Congregational Minister in the city, arriving in 1888 when the picture was taken. In 1889 the Daily World carried a piece from Winnipeg: “The Rev. J. Pedley, brother of the Rev. Mr. Pedley of this city, is gaining considerable fame in Vancouver as a preacher. His eloquent and stirring sermons are said to draw immense congregations. As a result of his work a good solid church building will be erected in Vancouver this year, the plan of it being similar to that of the Central Congregational church of Winnipeg.” Reverend Pedley’s name was James, and his brother’s Hugh; in 1890 they went on a camping expedition to Rat Portage (which made the newspaper – in what must have been a slow news week). In 1894 it was reported that he had travelled to Montreal, and was returning to Vancouver, but the house was occupied by James Macaulay of James and Macaulay, and the Pedley’s aren’t listed (but neither is a business called James and Macaulay). In 1895 Rev Pedley is back, (shown as Rev J W Pedley – which was his correct initials). In 1896 the pastor was Rev H C Mason, who lived in a different house on Richards Street, and there were four new residents of the house. In 1912 Rev James Pedley played an important role in creating the United Church from the merger of the Methodist, Presbyterian and Congregational denominations in Canada. In 1915 he published a biography of Lord Strathcona; (Donald A. Smith, the Canadian Pacific director and politician). We know the Pedley’s had at least one son, as the Museum of Vancouver have a ceremonial trowel presented when the church foundation stone was laid in 1888 presented to the Archives by Rev. Pedley’s son, Lieut. Col. James Henry Pedley, in 1936. The 1911 Census shows him aged 18, born in 1892, living with his parents at 23 Harbord St in Toronto. The Times-Colonist reported the death of Rev Pedley in 1933, in Toronto. A three storey building was approved for the Sam Kee Company in 1912, designed by Kennerley Bryan, to be built by R P Forshaw at a cost of $16,000. This permit was for apartments/rooms; described in the more detailed press notice as “three-storey brick store & rooming house; facing is red brick relieved with green tile; window ledges cement; galvanized iron cornice surmounts the bldg.” (Sam Kee was essentially a fictional character, the merchant who ran the company was Chang Toy.) This doesn’t seem like an ideal location for a residential building, and what was built doesn’t fit the description exactly. This part of Keefer didn’t reach Columbia Street, because False Creek was right there. Across the street from this building was the Vancouver Gasworks, with a pair of retort houses on the street, and gasometers to the south. In the previous few years the edges of the channel had been tidied up, straightened and turned into a coal dock to deliver to the gasworks coal yard. Until it was abandoned and filled in some years later it occupied the place where Columbia Street would be extended; just to the west of this building. This building wasn’t shown in the 1913 street directory (when the property next door was identified as being occupied by “Foreigners”). It showed up in 1914 as ‘New Building”. 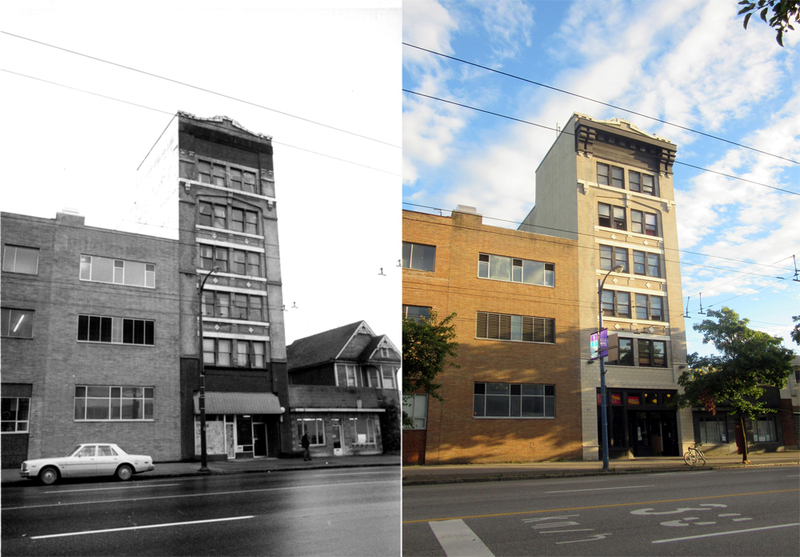 In 1915 the Maple Leaf Rice Mills were shown operating here, at 147 Keefer. While it didn’t reveal the owner, it suggested the business was Japanese. A year later a Chinese operator had taken over, Wing Kee Rice Mills. This was a Sam Kee owned company that Fred Townley had been hired to design a building for in 1912. We’re reasonably sure that it’s actually his design for the Rice Mill that got constructed. Paul Yee says that Sam Kee had operated a rice mill in the city from 1908. In 1924 the Rice Mills were no longer listed but the Sam Kee Company had moved their offices here from East Pender, and were still in business here in the mid 1950s. 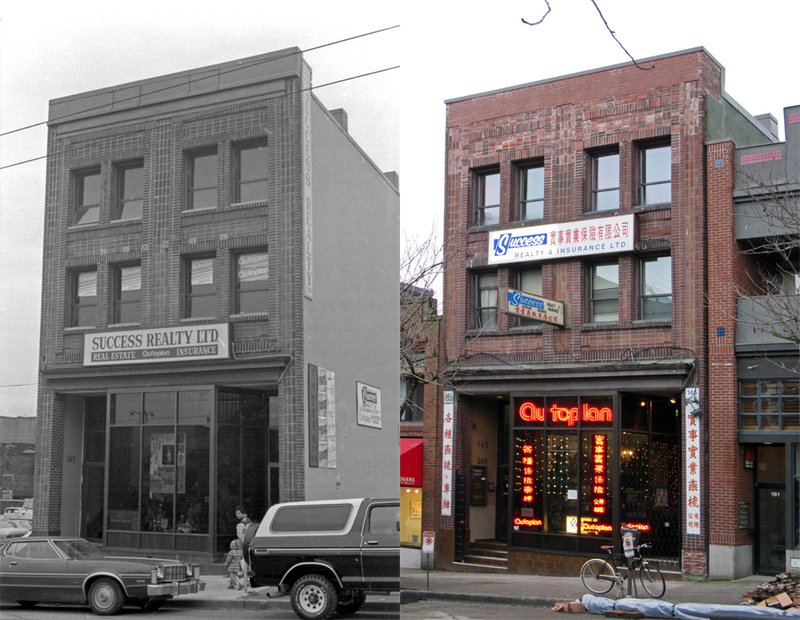 Today the building continues to houses office space – the same company was occupying the building in our 1978 image. The Hazelwood has just emerged from a cocoon of scaffold looking better than it has for many decades. Comprehensively restored and repaired, it’s one of the BC Housing acquisitions that’s been given an internal makeover and an external facelift. Years of paint have been removed, aluminum windows replaced by new wooden sashes, and the cornices restored. There’s even a new sign that looks just like the one in the 1940s. (There was a different sign in the 1926 Vancouver Public Library image (above), but you can see the one now replicated in the 1947 Archives image below. Perhaps this unexpected engineering and design attention was due to Thomas Hooper’s clients: Thomas Hooper and S B Snider. This was apparently Mr. Snider’s biggest investment, and as far as we can tell Thomas Hooper’s sole property investment, so getting it right was obviously important. Sanford Snider was shown aged 67 when he developed the hotel, (he was actually only 56, but the 1911 census doesn’t appear to have had the most diligent census clerks) and although the census gave a one word description of his occupation – ‘mines’, the street directory described him as the inspector of the National Finance Co Ltd. Sanford was from a family of German origin; his wife Sara was from an English family, but they had both been born in Ontario as had the two children still living at home in 1911, Lorna aged 26 (a schoolteacher) and 17-year-old Ronald. They had been in the city a decade earlier when Sanford was a ‘traveller’ and there were more children at home, (three daughters, Bertha, Emma and Elva, as well as Ronald) and his wife had been called (accurately) Sarah. There was one other son, also called Sanford, who had died as a child. Sanford had married Sarah Hutchcroft in 1880 in Newmarket, Ontario. Thomas Hooper was two years younger than Sanford Snider, and arrived from England in 1871 when his father brought the family to London, Ontario, where Thomas became a joiner and carpenter. They moved west to Emerson, Manitoba in 1878, where Thomas married in 1880, then moving on to Winnipeg where he worked with his older brother, who was an architect. Thomas moved further west in 1886, walking the last 500 miles of the journey (as the train wasn’t yet reaching Vancouver), and arriving a few weeks after the fire destroyed the city. Ne quickly established himself as an architect, achieving significant commissions like the Homer Street Methodist Church as early as 1888. His workload expanded, and at one point he had the largest practice in western Canada, with three offices in different cities. The dramatic downturn in the economy in 1913 saw work dry up. By 1915 Hooper had given up and moved to New York, where work started to come his way only to stop with the US entry into the Great war in 1917. He eventually returned to Vancouver, virtually broke, in 1927. He died on New Year’s Day, 1935 aged 77, and was buried in the family plot of the McCauls in Mountain View Cemetery. Sanford Byron Snider died in Penticton in 1948 aged 92.